Reporting is at core of any accounting system which is handled beautifully by Xero. Xero provides you a large number of reports on the go in an easy to use manner. 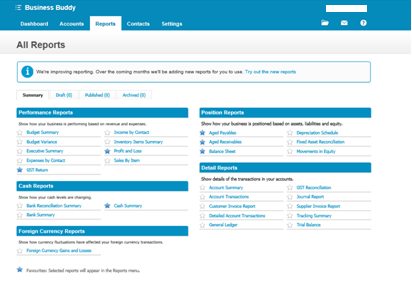 Here is a screenshot of the reports which are generated by Xero. There are also large number of reports in Payroll section which we have not dealt with in this manual. Performance reports help you to analyze the profitability of your business and the performance of business vis a vis your expectations from the budget. Budget Summary: It provides a summary of the budget figures added by you. Budget Variance: It shows the budget variance against the actual. Executive Summary: It provides an executive summary of the deviations for year on year basis. Cash Reports shows the reports on Cash generated during the period and report on bank reconciliations. Important reports in this section are Aged Payables and Aged Receivables. It helps to analyze the payments pending to be done and customers from whom the receivables are pending. This reports are more of bookkeeping side which can help you to determine the transactions during the period and the summary of the transactions in a particular account.